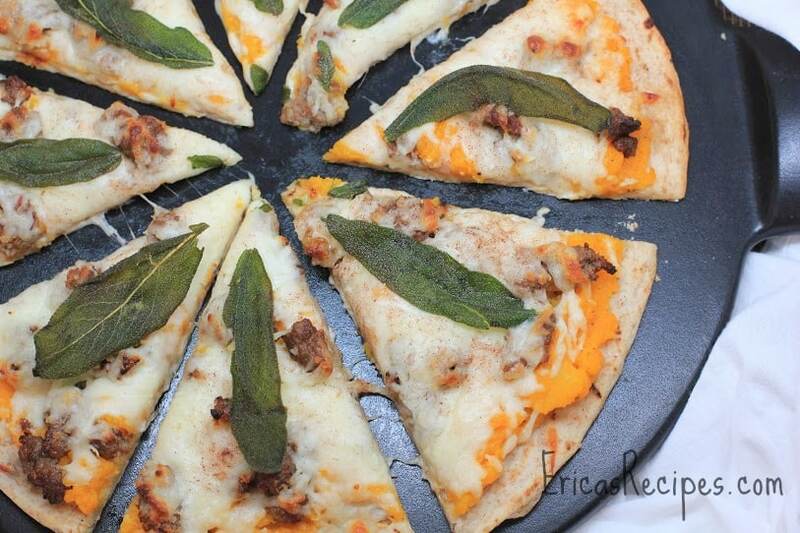 Squash and Sausage Pizza with Crispy Sage has all the flavors of fall, deliciously served up as a crispy pizza. This time of year, I do miss New England. It’s been so many years since I’ve lived there that you’d think I’d be over it. But today, after a run on the beach on a warm, sunny Florida day, I decided to slap some fall flavors on a new pizza. I really love how this turned out. 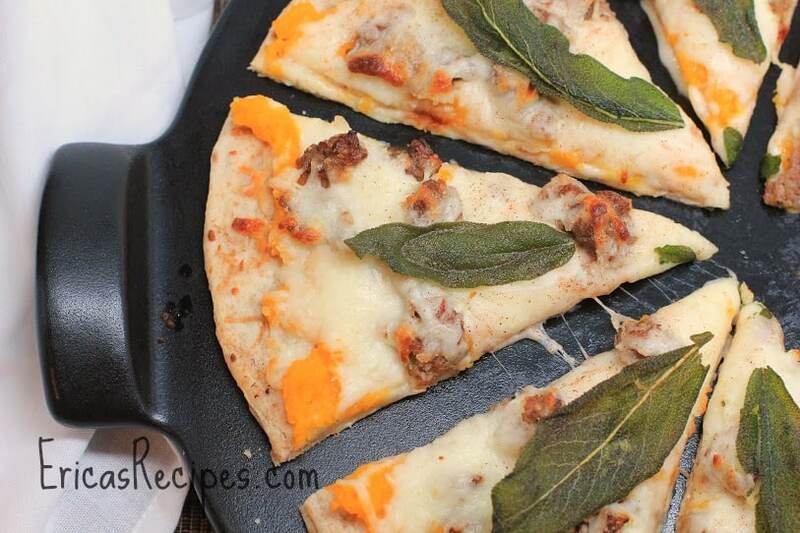 Squash and sausage are one of those combinations that is unexpectedly amazing. And the hint of cinnamon is just perfect. Steam the squash until fork tender (~20-30 minutes). Drain well. Transfer to a bowl and mash with a potato masher. Add a pinch salt and pepper. 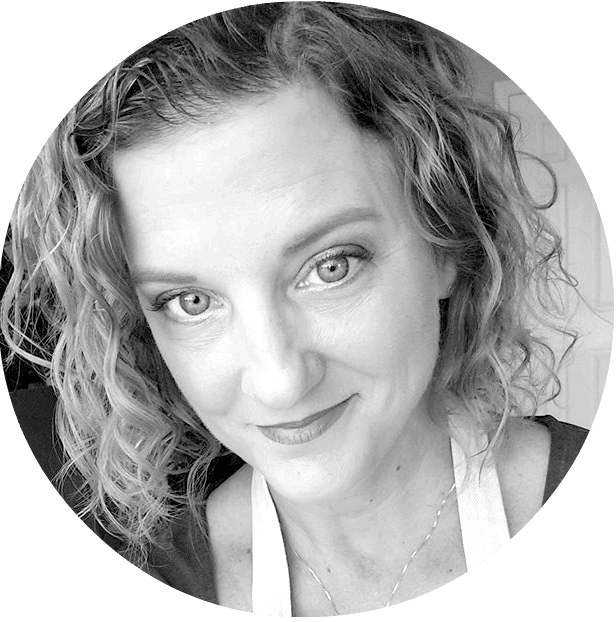 Taste for seasoning and sweetness. If your squash is from early in the season, like mine was, add up to 1/2 t sugar to sweeten it up. In a medium skillet on medium-high heat, heat the olive oil. Add the sage leaves so they lay flat and fry for a minute, flipping once. Transfer the leaves to a plate lined with paper towels. Preheat oven to 425F with the pizza stone (if using) on the middle rack. Once the oven is ready, continue to heat the stone in the oven an additional 10 minutes to make sure it is fully heated. Remove the pizza stone from the oven. Put the pizza crust on the stone. Layer, in order, the squash, sausage, cheese, and sage leaves. Finish with a light dusting of cinnamon. Put the stone with the pizza back in the oven and cook 10-12 minutes until cheese is melty and crust is toasty. Remove from the oven and serve! Will be making this Saturday! Looks great!!!! Thanks Erica!